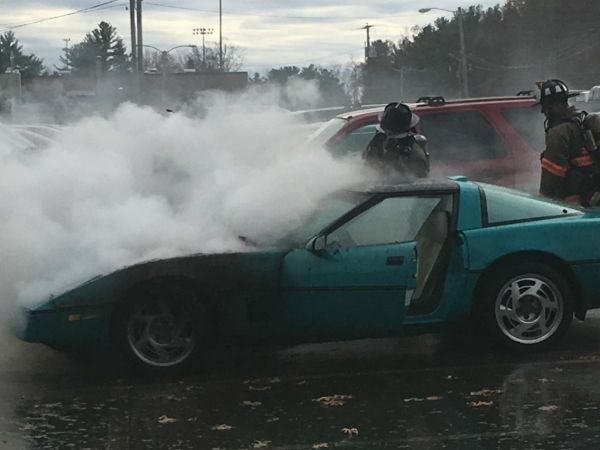 The New Hampshire Town of Merrimack Fire and Rescue team arrived on the scene of a 1986 Corvette on fire in the parking lot at Merrimack High School this afternoon. According to a press release from Fire Marshal John Manuele, the an electrical fire under the hood of the 1986 Corvette was the source of the blaze. The team worked quickly to extinguish the fire as the Corvette was parked in close proximity to other cars. Once out, the remains of the hood were removed and the engine fire extinguished. The Corvette was owned by a female student at the high school who called 911 to report the fire. She told authorities that she heard a bang come from the engine compartment after she parked the car and smoke soon started coming out from under the hood. Luckily, no one was injure in the fire and the cause was determined to be accidental. Firefighters say the 1986 Corvette is a total loss after a blaze caused by an electrical problem.